It’s been three years since Mr Tin Box and I had a night away together. Recently he’s been working away a lot so just before Christmas we took advantage of the season of goodwill and asked the grandparents to look after the little Tin Boxes for 24 hours. Our aim: relax and enjoy a bit of time as a couple, not as mum and dad. After all there would be no kids if we hadn’t hit it off as a pair in the first place. It’s only fair that we nurture that, right? Inevitably there was quite a lot of chat about the kids but we had eight weeks of baby development and toddler fun to catch up on. 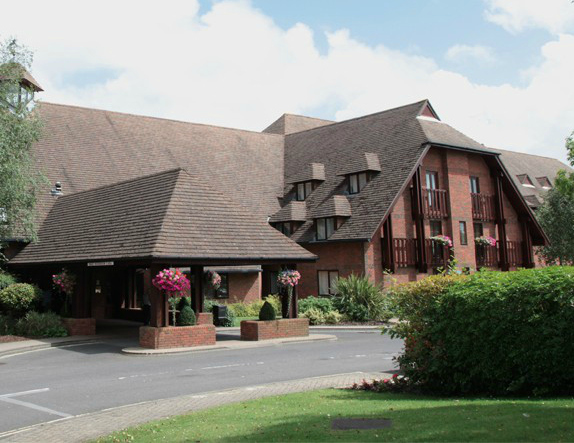 The location for our sneaky getaway was the Solent Hotel & Spa at Whiteley in Hampshire. We chose it because we could chill with a spa treatment, plus Whitleley Shopping Centre and a new cinema are just down the road. 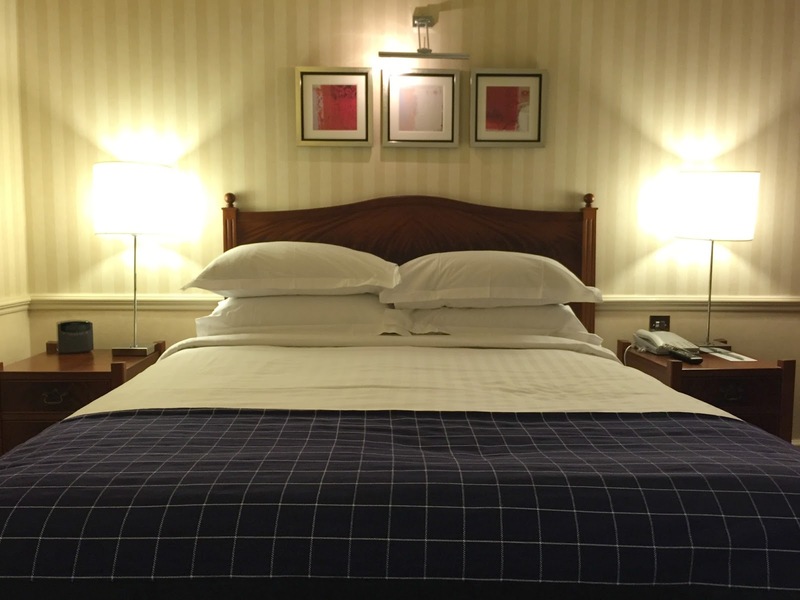 Solent Hotel & Spa is a 4 star hotel with a rustic feel. Don’t be fooled by the wood paneling and stone floors – it’s relatively modern, but done extremely well. I’ve visited the hotel before for a spa day and business meetings, but I’ve never stayed there so was keen to tick this off the list. As residents we had free access to the leisure club, which comes with a gym, pool and sauna. There’s also a lovely little spa where I’ve previously had the most amazing pregnancy massage. I recommend it to everyone I know who’s having a baby. As mummy/daddy nights off don’t come round too regularly we treated ourselves to the extra space provided by a junior suite with separate bedroom and sitting areas. We also had free super-fast wifi, which did exactly what it said on the tin, a coffee machine with fresh milk rather than those little UHT pots, and fluffy robes and slippers for our trip to the spa. Paying a bit more for a bigger room did make the night feel extra special. I’ve already mentioned I’ve been to the spa at The Solent Hotel before so I had high expectations for our visit. As we were booking last minute I called in advance to see what treatments might be available for Mr TB and I. The team helpfully suggested their signature massage for us both, which covers the back, shoulder and neck followed by a scalp massage. After checking in and dropping our bag in our room we grabbed our robes and headed for the spa. When we arrived we were shown into the relaxation room, which was busy with other spa-goers. We still found two recliners together. No sooner had we put our feet up we were called for our treatments. I was expecting to be shown to a double treatment room, but we were taken off separately. It wasn’t a bad thing in the end as I would have been incapable of conversation while having the tension worked out of my muscles. After 45 minutes I was feeling very relaxed – had the scalp massage gone on any longer I might have fallen sleep. 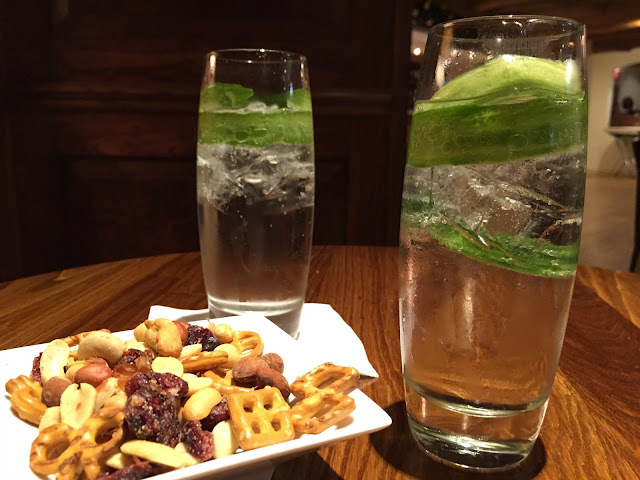 I rejoined Mr TB in the lobby outside the relaxation room where there were plentiful fruit and herb teas, water and even cakes for us to help ourselves to. Yummy! We may have lingered longer if there was space to sit down but it was obviously a very busy day. Instead we decided to have a dip in the 13m pool. We didn’t stay long as there wasn’t much room to swim as part of the pool was sectioned off for a swimming lesson and there were already lots of other people splashing around. I used it as a good excuse to visit the sauna while Mr TB went off to the gym to get in a bit of training for the London Marathon. There’s been a lot of work going on just down the road from the Solent Hotel to revamp the shopping and social scene at Whiteley. It now has a range of chain restaurants and a Cineworld cinema. This made it an ideal location for our night off as everything was so close.It was the week after Star Wars had come out so Mr TB was quite keen on seeing that, but I really wanted to see Spectre. Luckily Mr TB conceded and we got to see Daniel Craig in action – yay! Afterwards we ate at Wildwood, which is just outside Cineworld. It’s not somewhere I’ve ever heard of before – remember, it’s been a long time since we’ve been out – but it was one of a handful of eateries in Whiteley that looked like a proper restaurant rather than a glammed up fast food joint. I felt a little sorry for our waitress as she didn’t know that an aperitif was a pre-dinner drink and brought us our wine at the same time as our cocktails. It made the start of our meal feel a bit hurried. However, the food was lovely. The menu was Italian inspired with a mix of pastas, pizzas and salads, as well as meaty dishes from the grill. Mr TB had deep fried goats cheese to start, while I had the mozzarella and tomato salad (thinking of the huge turkey dinner to come later in the week). For our main course we both chose a stone baked pizza. I had the goats cheese and chorizo topping and Mr TB went for the Giganti Meat – typical boy. They were both very tasty. There was no way we could eat anything else, so we opted for a liquid dessert. As there’s not really anywhere to have after dinner drinks in Whiteley Shopping Village we headed back to the hotel where we had the most delicious gin and tonic from the bar. The next morning we woke up refreshed from an uninterrupted night’s sleep on a wonderfully soft bed and headed down for breakfast. 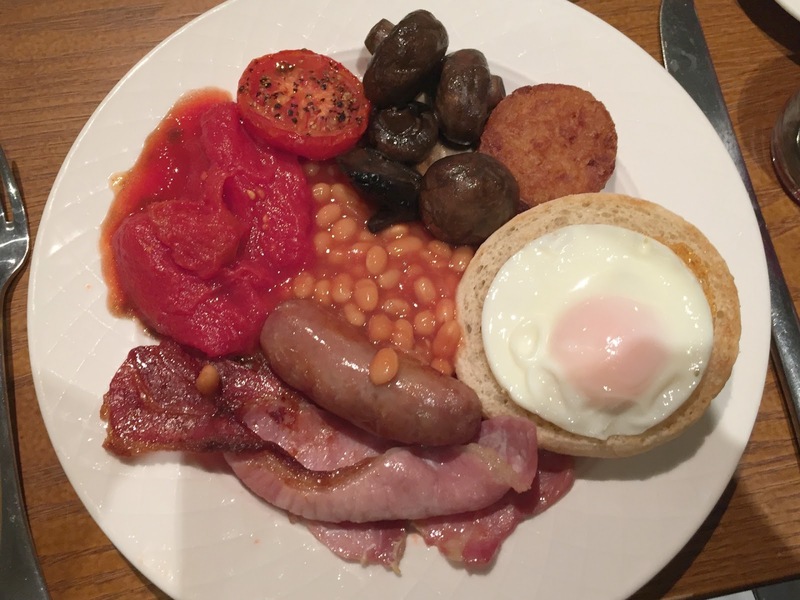 The restaurant usually serves breakfast buffet style but as the hotel was quiet ahead of Christmas they were cooking to order.We both went for the full English breakfast, straddled by fruit, yogurt and toast – as you do. My eyes were much bigger than my belly and I couldn’t finish it all despite it being excellent. Before we retook the reins of parenthood we popped into West Quay Shopping Centre in Southampton to do a spot of child-free browsing. This was a trip just for us as we had already done our Christmas shopping. We weren’t there long in the end. You forget how easy it is to move between the different levels of a department store when you don’t have a toddler or pushchair in tow. After a quick stop for a bite of lunch – I’m not sure how I fitted it in – we headed home to our lovely girls. Of course, they had been great for both sets of grandparents who had been looking after them during different stages of our 24 hours away. Knowing this made me feel even more justified about our decision to take a break. Ultimately, if they are happy, then so are we. Especially if we can sneak in the odd spa day every now and again. Have you had a couple break since becoming parents? Where did you go? How was it? I’d love to know. What a lovely place to stay….It sounds like you had a wonderful time. As I'm reading this, my shoulders and back keep nudging me: See that? They got a message…we should do that. Your "day off" sounds wonderful! Our youngest is away at college now, so we're enjoying our days off but find the days when she's home so much more enjoyable now! (Not that we didn't love her before! 😉 Sounds like a great – and very relaxing – day off! Ah so jealous 😀 That sounds like such a dream break… Spa and all 🙂 We haven't been on any type of a mini-break as a couple since our daughter was born – just a couple of nights out, going to concerts, that's it. It is important to make that time for you as a couple though, maybe we should make more of an effort. Hoorah! High five for nights off. Enjoy your 40th! Oh what a treat! It sounds like a wonderful night off and exactly what you both needed! Oh, lovely to have some time away together – my husband and I managed a night away for our 10th wedding anniversary and then my daughter stayed overnight with my brother-in-law earlier this month. It's been so busy we didn't even try to go away but had dinner out plus a movie then, luxury of luxuries, a lie in! Bliss. Yours sounds such a lovely break too.